Odontogenic Cysts; Dentigerous Cyst; p53. Objectives: An odontogenic keratocyst (OKC) is a developmental odontogenic cyst with aggressive clinical behavior. This cyst shows a different growth mechanism from the more common dentigerous cyst and now has been renamed as a keratocystic odontogenic tumor (KCOT). Inflammation can assist tumor growth via different mechanisms including dysregulation of the p53 gene. This study aims to assess and compare the expression of tumor suppressor gene p53 in inflamed and non-inflamed types of OKC and dentigerous cyst. Methods: Immunohistochemical expression of p53 was assessed in 14 cases of dental follicle, 34 cases of OKC (including 18 inflamed OKCs), and 31 cases of dentigerous cyst (including 16 inflamed cysts). Results: The mean percentage of p53 positive cells was 0.7% in dental follicles, 5.4% in non-inflamed OKCs, 17.3% in inflamed OKCs, 1.2% in non-inflamed dentigerous cysts, and 2.2% in inflamed dentigerous cysts. The differences between the groups were statistically significant (p < 0.050) except for the difference between inflamed and non-inflamed dentigerous cysts, and between dental follicle and non-inflamed dentigerous cyst. Conclusions: The difference in p53 expression in OKC and dentigerous cyst can explain their different growth mechanism and clinical behavior. Inflammation is responsible for the change in behavior of neoplastic epithelium of OKC via p53 overexpression. The aim of this study was to assess and compare the expression of tumor suppressor genes p53 in dentigerous cyst, OKC, dental follicle, and their inflamed types to find an explanation for their different growth mechanisms and to discover the relationship between the presence of inflammation and the expression of p53. The protocol for this study was approved by the university Research and Ethics Committee. In this retrospective study, 79 paraffin-embedded tissue blocks including 34 cases of OKC (18 inflamed and 16 non-inflamed), 31 cases of dentigerous cyst (16 inflamed and 15 non-inflamed), and 14 cases of dental follicle were chosen from the archives of Department of Oral and Maxillofacial Pathology, School of Dentistry, Shahid Beheshti University of Medical Sciences, from 2001 to 2012, after verification of the clinical and radiographic data. KCOTs were nonsyndromic and primary (nonrecurrent). All dental follicles were collected from teeth extracted for orthodontic reasons and radiographically presented as a radiolucency less than 3 mm in diameter. The diagnoses were confirmed again by an oral and maxillofacial pathologist. All inflammatory samples included more than 70% inflammatory cells subjacent to the epithelium observed in 400 × magnification field while all the noninflammatory cases had less than 15% inflammatory cells in the field. The EnVision system was used for immunohistochemical staining. Paraffin blocks were cut into 5 µm sections. The sections were deparaffinized by first placing them in a 37 °C oven and then into xylene solution. Samples were then washed with 100% ethanol followed by phosphate-buffered saline (PBS) and distilled water. Sections were incubated with 3% H2O2 for 10 minutes to block endogenous peroxidase activity. For antigen retrieval, we placed samples in a plastic dish containing citrate buffer (PH-6) and restored them for 10 minutes in an autoclave with 1 atm pressure at 120 °C. Samples were then allowed to cool at room temperature for 30 minutes and washed with PBS for 10 minutes. Protein block solution was poured on each specimen. Ready-to-use monoclonal mouse antihuman p53 protein (clone DO7 code1581; Dako, Denmark) was used as the primary antibody. After 30 minutes at 4 °C followed by 60 minutes at room temperature, samples were washed with PBS. The secondary antibody (Dako, Denmark) was reacted for 30 minutes at room temperature. Diaminobenzidine (DAB) (dilution 1:2; Dako, Denmark) was used as the chromogen to visualize the reaction. Slides were then washed with water and counterstained with hematoxylin. Finally, they were dehydrated with alcohol and mounted. Oral squamous cell carcinoma was used as the positive control and substitution of primary antibody with nonimmune serum served as a negative control. The number of positive cells in the epithelial lining of the cysts as well as the connective tissue wall were counted to evaluate the p53 stained sections. Brown stained nuclei regardless of the color intensity was considered positive. For the epithelial lining of the cysts number of the positive cells out of every 100 cells in 10 randomly selected fields were counted under 400 × magnification (total 1 000 cells).35,36 To evaluate p53 expression in the connective tissue wall of the cysts, 10 random fields near the epithelial-connective tissue interface were selected and counted under 400 × magnification (total 1 000 cells). For the inflamed cysts, 10 fields in the epithelium-connective tissue interface and five fields in the deep portion of the cyst wall were also counted. The proportion of positive cells was calculated for each specimen. For each of the five groups, the mean number of all specimens in that group was calculated as the final percentage. < 0.05o was considered statistically significant. Expression of p53 in the epithelium in a decreasing order of frequency was as follows: inflamed OKCs (17.3±7.1%) > non-inflamed OKCs (5.4±4.8%) > inflamed dentigerous cysts (2.2±2.4%) > non-inflamed dentigerous cysts (1.2±1.3%) > dental follicle (0.7±0.9%) [Figure 1 and Table 1]. Table 1: Mean percentage of p53 expression and correlation of p53 expression between the groups. OKC: odontogenic keratocyst; SD: standard deviation. Figure 1: p53 expression in (a) epithelial cells of dental follicle, (b) non-inflamed dentigerous cyst, (c) non-inflamed odontogenic keratocyst (OKC), (d) inflamed dentigerous cyst, (e) inflamed OKC, (f) oral squamous cell crcinoma as a positive control, 400 × magnification. The differences between all the groups were statistically significant (p < 0.05,), except differences between inflamed dentigerous cyst and non-inflamed dentigerous cyst, and between non-inflamed dentigerous cyst and dental follicle. In the connective tissue wall of the cysts, no p53 expression was detected except for the inflammatory cells infiltrate in the inflamed cysts. In the current study, we found that the expression of p53 in OKC was significantly greater than in the dentigerous cyst and dental follicle and the intensity of staining in OKC was greater than other lesions. We found increased p53 expression in inflamed OKC. Inflammation has a puzzling effect on the epithelium of OKC and remains a subject of controversy.8,41 However, many studies suggested the role of inflammation in the enhancement of aggressive behavior in OKC by increasing its proliferative potential.8,41 It is now accepted that the inflammatory cells within a tumor, assist tumor growth by secretion of proteolytic, angiogenic, and mitogenic factors.28 Inflammation can also cause dysregulation of p53 or inhibition of several of its functions. A number of studies suggested that p53 is a general inhibitor of inflammation. During the chronic inflammatory process, upregulation of the nuclear factor kappa B (NFkB) pathway occurs, which is activated by various cytokines. The anti-inflammatory effects of p53 is due to its antagonistic effect on NFkB.11,12 We suggest that the effect of inflammation on the proliferative activity in OKC might be caused by one of the p53-dependent mechanisms. In our study, expression of p53 was weak or not detected in dental follicles, which is in agreement with the results of Matsumoto et al.24 We found statistically significant difference in p53 expression between dental follicle and inflamed dentigerous cyst. However, the difference in p53 expression between non-inflamed dentigerous cyst and dental follicle was not statistically significant. Different studies have shown increased expression of proliferation markers and antiapoptotic proteins in inflamed dentigerous cyst.7,8 We suggest that the increased p53 expression resulting from the presence of inflammation leads to development of dentigerous cyst and after the resolution of inflammation p53 expression decrees and the cyst grows as a result of increased osmotic pressure within its lumen, which reflects the non-aggressive clinical behavior of dentigerous cyst. Higher p53 expression in both inflamed and non-inflamed types of OKC compared to dentigerous cyst emphasizes the neoplastic nature of OKC. We found that inflammation leads to a significant overexpression of p53 in OKC, while in dentigerous cyst there was no statistically significant difference in p53 expression between inflamed and non-inflamed types, which might be attributed to the loss of p53 regulatory mechanisms in OKC. We investigated p53 protein expression in the connective tissue wall of cysts to study the role of p53 expression in mesenchymal cells in the growth of OKC and dentigerous cyst and found no p53 expression in the connective tissue, except for the inflammatory cells infiltrate in the inflamed cysts. These findings suggest that if mesenchymal cells have an active role in the growth of OKC, this effect is not mediated by p53-altered expression. Expression of p53 is greater in OKC than in dentigerous cyst, which may indicate some changes in the cell cycle. Inflammation significantly increases p53 expression in OKC but does not have such effect on the dentigerous cyst. This may be attributed to the potential of the OKCs epithelium to increase cell cycle alterations when accompanied by inflammation. The authors would like to express their gratitude to the Department of General Pathology of Masih Daneshvari Hospital especially Mrs. Mahboobeh Mesgarha and Mr. Abdollah Mahinpour for their technical and statistical assistance. 1. Li TJ. The odontogenic keratocyst: a cyst, or a cystic neoplasm? J Dent Res 2011 Feb;90(2):133-142. 2. Shear M. The aggressive nature of the odontogenic keratocyst: is it a benign cystic neoplasm? Part 2. Proliferation and genetic studies. Oral Oncol 2002 Jun;38(4):323-331. 3. Malcić A, Jukić S, Anić I, Pavelić B, Kapitanović S, Kruslin B, et al. Alterations of FHIT and P53 genes in keratocystic odontogenic tumor, dentigerous and radicular cyst. J Oral Pathol Med 2008 May;37(5):294-301. 4. Dineshkumar T, Priyadharsini N, Gnanaselvi UP, Sathishkumar S, Srikanth RP, Nagarathinam AE. Evaluation and Comparison of Vascular Endothelial Growth Factor Expression between Ameloblastoma and Keratocystic Odontogenic Tumor. J Int Oral Health 2015 Jan;7(1):48-52. 5. Shetty DC, Urs AB, Godhi S, Gupta S. Classifying odontogenic keratocysts as benign cystic neoplasms: a molecular insight into its aggressiveness. J Maxillofac Oral Surg 2010 Mar;9(1):30-34. 6. Shear M. The aggressive nature of the odontogenic keratocyst: is it a benign cystic neoplasm? Part 1. Clinical and early experimental evidence of aggressive behaviour. Oral Oncol 2002 Apr;38(3):219-226. 7. Sreedhar G, Raju MV, Metta KK, Manjunath S, Shetty S, Agarwal RK. Immunohistochemical analysis of factors related to apoptosis and cellular proliferation in relation to inflammation in dentigerous and odontogenic keratocyst. J Nat Sci Biol Med 2014 Jan;5(1):112-115. 8. Singh H, Shetty D, Kumar A, Chavan R, Shori D, Mali J. A molecular insight into the role of inflammation in the behavior and pathogenesis of odontogenic cysts. Ann Med Health Sci Res 2013 Oct;3(4):523-528. 9. Whyte DA, Broton CE, Shillitoe EJ. The unexplained survival of cells in oral cancer: what is the role of p53? J Oral Pathol Med 2002 Mar;31(3):125-133. 10. Wawryk-Gawda E, Chylińska-Wrzos P, Lis-Sochocka M, Chłapek K, Bulak K, Jędrych M, et al. P53 protein in proliferation, repair and apoptosis of cells. Protoplasma 2014 May;251(3):525-533. 11. Gudkov AV, Gurova KV, Komarova EA. Inflammation and p53: A Tale of Two Stresses. Genes Cancer 2011 Apr;2(4):503-516. 12. Cooks T, Harris CC, Oren M. Caught in the cross fire: p53 in inflammation. Carcinogenesis 2014 Aug;35(8):1680-1690. 13. Portwine C. p53–the link between inflammation and cancer? Pediatr Res 2000 May;47(5):573. 14. Poomsawat S, Punyasingh J, Vejchapipat P. Immuno-histochemical expression of p53 protein and iNOS in odontogenic cysts. J Med Assoc Thai 2009 Jul;92(7):952-960. 15. Alur J, Narayan TV, Mohanty L, Shenoy S, Jamadar S, Shetty S. Ki-67 and p53 expression in solitary sporadic, syndrome associated and recurrent keratocystic odontogenic tumor. J Oral Maxillofac Pathol 2014 Sep;18(Suppl 1):S21-S25. Dehnad V, Yasaei V, Mashhadi Abbas F, Bandehpour M. Expression of P53 and p63 in epithelium of dentigerous cyst and odontogenic keratocyst. Cell Journal. 2011winter; 12(Suppl 1):24. 17. Gadbail AR, Patil R, Chaudhary M. Co-expression of Ki-67 and p53 protein in ameloblastoma and keratocystic odontogenic tumor. Acta Odontol Scand 2012 Dec;70(6):529-535. 18. Mendes RA, Carvalho JF, van der Waal I. A comparative immunohistochemical analysis of COX-2, p53, and Ki-67 expression in keratocystic odontogenic tumors. Oral Surg Oral Med Oral Pathol Oral Radiol Endod 2011 Mar;111(3):333-339. 19. Seyedmajidi M, Nafarzadeh S, Siadati S, Shafaee S, Bijani A, Keshmiri N. p53 and PCNA Expression in Keratocystic Odontogenic Tumors Compared with Selected Odontogenic Cysts. Int J Mol Cell Med 2013;2(4):185-193. 20. Shahela T, Aesha S, Ranganathan K, T R, Roa K UD, Joshua E, et al. 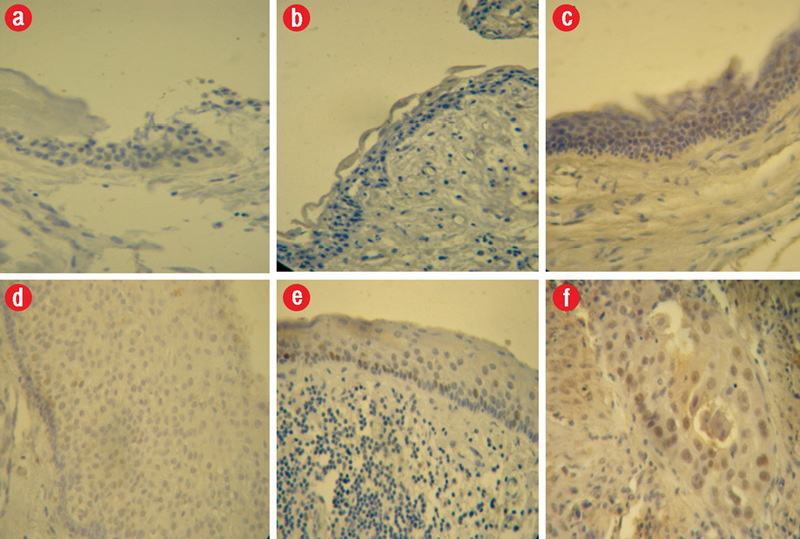 Immunohistochemical Expression of PCNA in Epithelial Linings of Selected Odontogenic Lesions. J Clin Diagn Res 2013 Nov;7(11):2615-2618. 21. Slootweg PJ. p53 protein and Ki-67 reactivity in epithelial odontogenic lesions. An immunohistochemical study. J Oral Pathol Med 1995 Oct;24(9):393-397. 22. Li TJ, Browne RM, Prime SS, Paterson IC, Matthews JB. p53 expression in odontogenic keratocyst epithelium. J Oral Pathol Med 1996 May;25(5):249-255. 23. Kaplan I, Hirshberg A. The correlation between epithelial cell proliferation and inflammation in odontogenic keratocyst. Oral Oncol 2004 Nov;40(10):985-991. 24. Matsumoto MA, Filho HN, Jorge FM, Salvadori DM, Marques ME, Ribeiro DA. Expression of cell cycle regulatory proteins in epithelial components of dental follicles. J Mol Histol 2006 May;37(3-4):127-131. 25. Razavi SM, Poursadeghi H, Aminzadeh A. Immunohistochemical comparison of cyclin D1 and P16 in odontogenic keratocyst and unicystic ameloblastoma. Dent Res J (Isfahan) 2013 Mar;10(2):180-183. 26. Mascitti M, Santarelli A, Zizzi A, Procaccini M, Lo Muzio L, Rubini C. Expression of p73 and TRAIL in odontogenic cysts and tumors. J Oral Sci 2016;58(4):459-464. 27. Varsha B, Gharat AL, Nagamalini B, Jyothsna M, Mothkur ST, Swaminathan U. Evaluation and comparison of expression of p63 in odontogenic keratocyst, solid ameloblastoma and unicystic ameloblastoma. J Oral Maxillofac Pathol 2014 May;18(2):223-228. 28. Alaeddini M, Mostafaloo E, Mirmohammadkhani O, Eshghyar N, Etemad-Moghadam S. Exploring the concept of “inflammatory angiogenesis” in keratocystic odontogenic tumor. Med Oral Patol Oral Cir Bucal 2013 Mar;18(2):e241-e245. 29. Azevedo RS, Cabral MG, dos Santos TC, de Oliveira AV, de Almeida OP, Pires FR. Histopathological features of keratocystic odontogenic tumor: a descriptive study of 177 cases from a Brazilian population. Int J Surg Pathol 2012 Apr;20(2):154-160. 30. Guler N. Comunoglu N, Cabbar1 F. Ki-67 and MCM-2 in Dental Follicle and Odontogenic Cysts: The Effects of Inflammation on Proliferative Markers. Sci World J 2012;946060 [cited 2012 Jun 18]. Available from: http://www.hindawi.com/journals/tswj/2012/946060/. 31. Small IA, Waldron CA. Ameloblastomas of the jaws. Oral Surg Oral Med Oral Pathol 1955 Mar;8(3):281-297. 32. Ustuner E, Fitoz S, Atasoy C, Erden I, Akyar S. Bilateral maxillary dentigerous cysts: a case report. Oral Surg Oral Med Oral Pathol Oral Radiol Endod 2003 May;95(5):632-635. 33. Adelsperger J, Campbell JH, Coates DB, Summerlin DJ, Tomich CE. Early soft tissue pathosis associated with impacted third molars without pericoronal radiolucency. Oral Surg Oral Med Oral Pathol Oral Radiol Endod 2000 Apr;89(4):402-406. 34. Ong’uti MN, Cruchley AT, Howells GL, Williams DM. Ki-67 antigen in ameloblastomas: correlation with clinical and histological parameters in 54 cases from Kenya. Int J Oral Maxillofac Surg 1997 Oct;26(5):376-379. 35. Soluk Tekkeşın M, Mutlu S, Olgaç V. Expressions of bax, bcl-2 and Ki-67 in odontogenic keratocysts (Keratocystic Odontogenic Tumor) in comparison with ameloblastomas and radicular cysts. Turk Patoloji Derg 2012;28(1):49-55. 36. Clark P, Marker P, Bastian HL, Krogdahl A. Expression of p53, Ki-67, and EGFR in odontogenic keratocysts before and after decompression. J Oral Pathol Med 2006 Oct;35(9):568-572. 37. Baas IO, Mulder JW, Offerhaus GJ, Vogelstein B, Hamilton SR. An evaluation of six antibodies for immunohistochemistry of mutant p53 gene product in archival colorectal neoplasms. J Pathol 1994 Jan;172(1):5-12. 38. Nylander K, Nilsson P, Mehle C, Roos G. p53 mutations, protein expression and cell proliferation in squamous cell carcinomas of the head and neck. Br J Cancer 1995 Apr;71(4):826-830. 39. Okazaki Y, Tanaka Y, Tonogi M, Yamane G. Investigation of environmental factors for diagnosing malignant potential in oral epithelial dysplasia. Oral Oncol 2002 Sep;38(6):562-573. 40. Sjögren S, Inganäs M, Norberg T, Lindgren A, Nordgren H, Holmberg L, et al. The p53 gene in breast cancer: prognostic value of complementary DNA sequencing versus immunohistochemistry. J Natl Cancer Inst 1996 Feb;88(3-4):173-182. 41. Browne RM. Per[cyst]ent growth: the odontogenic keratocyst 40 years on. Ann R Coll Surg Engl 1996 Sep; 78(5): 426–433.